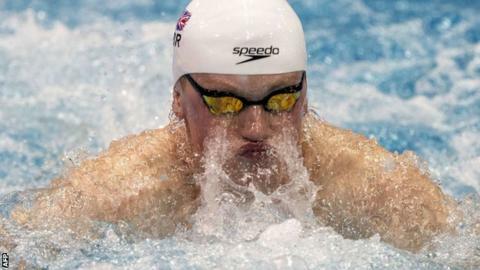 Britain's Adam Peaty and Hannah Miley have won silver medals at the European Short Course Championships in Israel. World champion Peaty lost out on 50m breaststroke gold by a 100th of a second to Slovenia's Damir Dugonjic. Commonwealth champion Miley won silver in the 400m individual medley, with Hungary's Katinka Hosszu taking gold. The tournament, in Netanya, runs until Sunday, 6 December and features Britons Liam Tancock, Jazz Carlin and Georgia Coates.